At Least 123 Women Will Be In The Next Congress. Just 19 Are Republicans. According to ABC News projections and FiveThirtyEight analysis, 113 women U.S. House and Senate candidates — from both parties — are expected to be winners.1 And there are eight unresolved races with at least one woman candidate.2 The number of women winners is certain to grow to 115, because both of the major-party candidates in two of the unresolved races are women. In the other six races, two of the women candidates are favored to win — Republicans Cindy Hyde-Smith in Mississippi’s Senate runoff and Mia Love in Utah’s 4th District — according to FiveThirtyEight’s analysis. Regardless, the 116th Congress will feature the largest class of female legislators ever. But there’s a sharp divide across party lines in this historic first. Of the 113 projected women winners, 98 are Democrats, and 15 are Republicans. (They will be joining 10 female senators who weren’t up for election this year: six Democrats and four Republicans.) It’s a sober reminder that this standout year for women is mostly a standout year for Democratic women. But this is not necessarily a new trend. According to data from the Center for American Women and Politics at Rutgers University, the Democratic Party has historically elected more women to Congress than the GOP has. 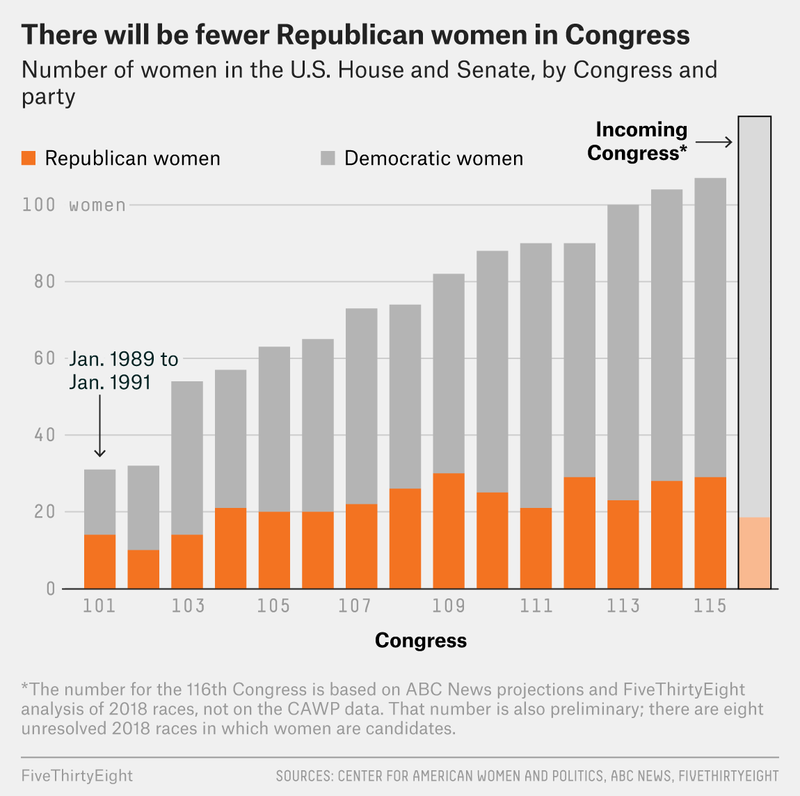 Even though at least 123 women will make up the 116th Congress, only 19 — or 15 percent — will be Republicans. That’s down from 27 percent in the 115th Congress, according to the center. So why are so few Republican women elected to Congress? We’ve looked at this question in-depth before the 2018 midterm elections, but it’s worth revisiting in the wake of 2018 to better understand the dynamics that have led to fewer Republican women running for office and the underlying reasons as to why. That said, lower female representation in government is not unique to the Republican Party. There are more men than women in Congress overall and in state legislatures, too. Up until this election, the share of women in Congress had yet to break 20 percent. If the number of women serving in the 116th Congress stays at 123, women will be 23 percent of the total. But why are fewer Republican women than Democratic women running for office? Political science gives us a few clues. Being tapped or recruited to run for office matters — especially among potential women candidates. But there is some evidence that Republican women don’t respond to recruitment efforts as positively as Democratic women do. In a survey experiment published in 2016, professors at Brigham Young University found that even if a community leader encouraged Republican women to run for office, they were not any more likely to run. Democratic women were more receptive, however. 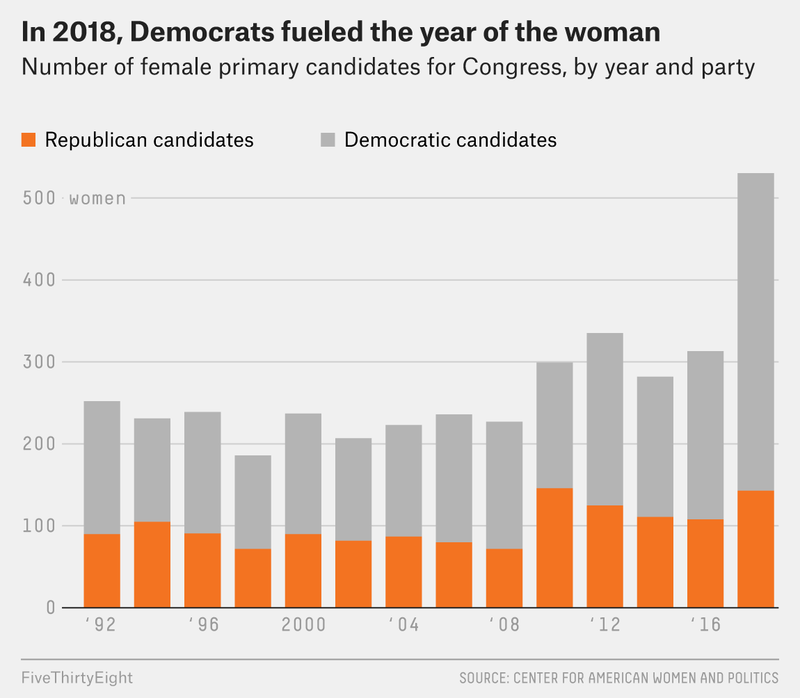 There is also some evidence that the pool of potentially successful Democratic women candidates is larger than the pool of Republican ones. A study published in 2014 in the journal Research and Politics defined the criteria for successful candidates as people who were closely aligned with one of the two political parties, who were highly educated and who held a high-status job, like an attorney or professor. The researchers then looked at data on the adult population of the U.S. to see who fit the criteria. Most of the people who did were men. The women who met the criteria tended to identify as Democrats. As time went on, the gap between the Democratic and Republican female candidate pools grew, the study found: In the 1970s and 1980s, the numbers of Democratic and Republican women considered potentially successful candidates were about the same. But in the 1990s, the Democrats began to pull away, and the gap has only grown since then. The authors of the 2014 study suggest that one factor behind the partisan gap could be the different beliefs about gender roles that are held by Democrats and Republicans. For example, according to a Pew Research Center survey, in 2012, 88 percent of Republicans said they have “old-fashioned values about family and marriage” compared with 60 percent of Democrats. And 21 percent of Republicans said they agreed that women should return to their traditional roles in society, compared with 16 percent of Democrats. These more conservative attitudes about family and women’s roles in society held by Republicans may have a negative influence on Republican women’s interest in pursuing a path that might lead to a political career. Major party donors may also be contributing to the gap in Republican and Democratic women elected to office. For example, groups that advocate for greater female representation help women get elected, but new research found that these kinds of groups receive more financial support from donors if they’re associated with the Democratic Party. This means women advocacy groups that are Democratic leaning, like Emily’s List, are more likely to be supported by donors than Republican groups, like Susan B. Anthony’s List. What’s more, these kinds of groups are more likely to be better integrated into the Democratic Party’s political culture. The study found that one possible reason that Republicans don’t give as much to these kinds of groups is because they haven’t heard of them. If the Republican Party wants more women candidates, one approach might be to expand the candidate pool by reimagining the characteristics that candidates have traditionally had. The GOP could also encourage women to run with a more catered message. If recruiters were to frame running for office by emphasizing the community-related aspects of a career in public service, studies show that women in general would express more interest in it. Finally, elevating the status of groups that focus on electing women could help GOP women receive more money from party insiders. A study from 2014 found that women are more active in politics when they are represented by women. So if Republicans prioritize women candidates, the GOP could not only increase their female representation in Congress, but also maybe encourage women who are leaving the GOP to stay. The tally of women winners kept by the Center for American Women and Politics at Rutgers University is currently two higher, at 115. One is a Senate contest — a runoff in Mississippi. And seven are in the House: CA-39, CA-45, GA-7, NM-2, NY-22, TX-23 and UT-4. In CA-45 and NM-2, two women are running against each other.